I must have been about five years old when I remember following my great-grandmother, garden shears in hand, into her garden. Mama Grace had a preference for plants with heavy perfume and, so, mock orange, roses, and bush upon bush of scented lilacs was how she had planted her yard. Each spring she filled a large glass pitcher with lilac stems heavy with flowers and placed it on top of her china cabinet. The fragrance filled the house and covered up the smell of fried bacon and pork chops that she consumed daily. We laugh at this sort of diet now, but she lived to be 105. Perhaps her love of lilacs was a contributing factor to her longevity. Syringa, the Latin name for the group of plants we know as lilacs, is derived from syrinx meaning a hollow stem. In Greek legend the nymph Syrinx was pursued by the god Pan. She asked assistance from river nymphs and was transformed into hollow water reeds that made a haunting sound. Pan cut the reeds to fashion the first set of pan pipes (a k a syrinx). The ancient Greek doctors used the hollow stems to inject medicines into their patients and also to drain off blood which was believed to be a cure for many ailments in those days. 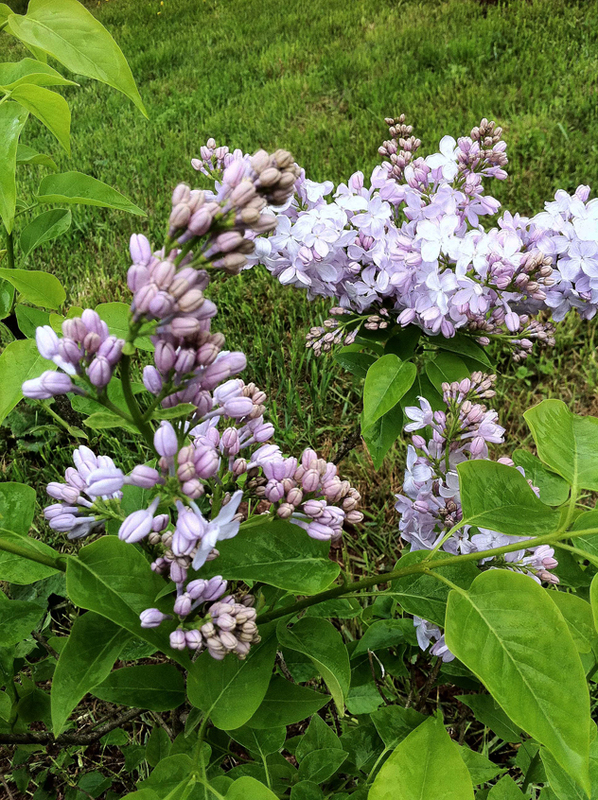 The Turks thought that the best pipes around were those made from straight stems of the lilac and so it makes sense that ‘Pipe tree’ was one of the first common names for lilacs in the English language. All lilacs belong to the genus Syringa, including 21 species and hundreds of cultivars. The majority of the species are native to Asia and surprisingly, given how popular they are here, none are native to North America. The common lilac, S. vulgaris, native of Eastern Europe, was introduced to Western Europe in 1600 and later to North America. One of the first references to lilac in America was in 1767 when Thomas Jefferson described planting them in his book on gardening. The first lilacs in the U.S. are believed to have been planted at Governor Wentworth’s estate in Portsmouth, New Hampshire, in 1750. It was a beautiful drive to Cherry Valley and when my wife and two gardening friends arrived at the Bates Hop House, we introduced ourselves to Mr. Alverson who was standing in a small shed having just checked out a long line of enthusiastic customers laden down with lilacs of all shades and sizes. Nurserymen who specialize in one genus or a small selection of specialized plants tend to be some of the most passionate gardeners around, so it is no coincidence that they often have the most interesting and highest quality collections of plants. We were all amazed by the variety of color and shapes and sizes of flowers we saw that day. There were around 160 varieties of lilacs to choose from and we stuffed the trunk of our friend’s car with plants. Unable to decide between so many beautiful plants we simply took as many as we could. Later in the year I called to interview Mr. Alverson who told me that he began his lilac nursery after he retired from teaching at SUNY Oneonta. He had been a dairy farmer for 12 years before that. Referring to an empty field next to his house he said, “The farmer in me wanted to use the five acres of land and I had the idea to start a farm stand by planting blueberry, raspberry bushes and apple trees.” Always passionate about lilacs he planted 300 cuttings in 1993 and three years later, when the twigs had matured, he sold 247 plants out of the 300 he planted. By 1996 he was selling 900 to 1,000 plants with 160 different varieties. Mr. Alverson offers small-size lilacs averaging 18 to 24 inches and the large size are available in 3, 4 and 5 foot sizes. His customer base is eager and comes from up to a 75 to 80 mile radius. With the help of two hoop greenhouses Mr. Alverson is able to bring a large selection of plants into flower in early May. Larger plants in 3 to 5 gallon pots are left outside during winter and begin flowering in mid May until mid June. The extended blooming period allows customers more than six weeks to view plants before purchase. By comparison other nurseries that sell a limited number of lilacs have an average viewing time of about ten days. 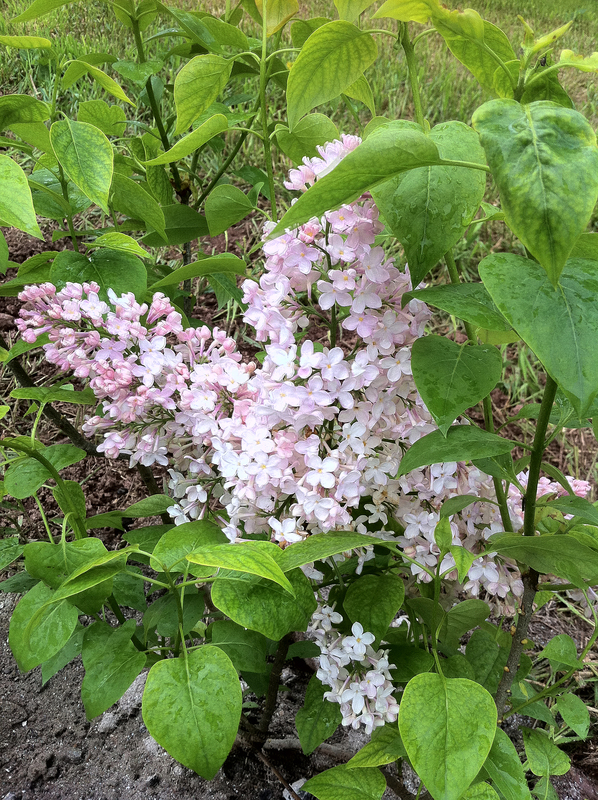 When I asked him what his favorite lilac was, his response was unsentimental: “The one going out the door with a check in my hand!” The most popular lilac he sells is Syringa ‘Beauty of Moscow.’ Listed as white, the buds are pale rosy pink with florets the size of apple blossoms. They have a triple layer of petals. I bought one. 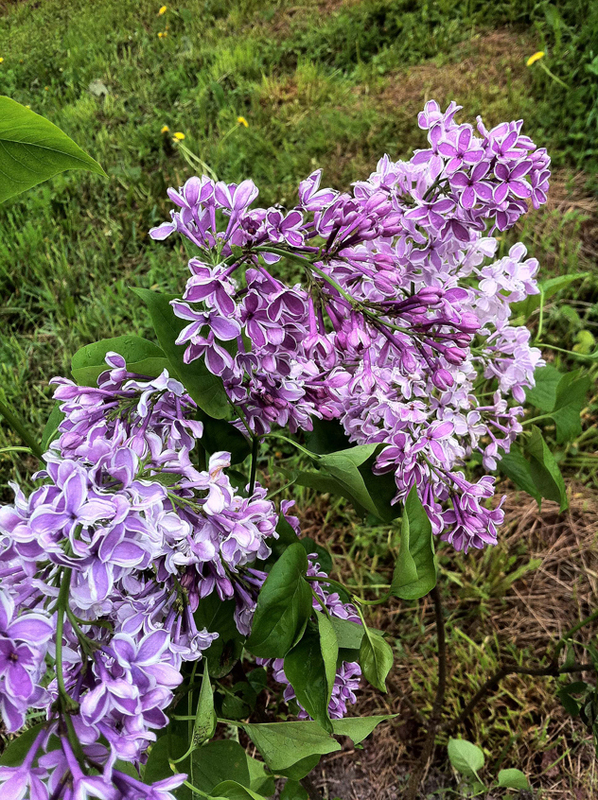 As he tells it, when Mr. Alverson began raising lilacs there were only 6 to 8 varieties on the market, and then an article about lilac varieties appeared in Martha Stewart’s Living magazine. Two thousand varieties were listed and there were photos of lilacs rarely seen before by the general public. The excitement over the article forced the nursery industry to start offering more varieties. On my first visit to Bates Hop House I kept returning to a spot where there were a series of lilacs called ‘Preston lilacs.’ Apparently, Isabella Preston was from Lancashire, England, and moved to Canada at the age of 31. Attending the Ontario Agricultural College she was later offered a position to establish a breeding program of ornamental plants. She bred lilies, roses, Siberian iris, columbine, flowering crab, and lilacs. But it is Miss Preston’s work with lilacs that is considered to be her biggest accomplishment. S. villosa and S. reflexa are the two species that she crossed to breed the plant that now bears her name, Syringa x prestoniae, and its hybrid Syringa x josiflexa. In her lifetime she named over 50 selections and introduced 47 new cultivars. which reaches a mature height of 4 to 5 feet. Its small rounded leaves and compact size make a dense screen. S. pubescens is considered a winner for fragrance. Native to China it has small white flowers tinged with purple and the perfume is an exquisite spicy-sweet combination. For early flowering lilacs look for S. oblata, native to China and Korea. It blooms about two weeks earlier than the common lilac. Also worth mentioning is Syringa reticulata, the tree lilac. It is an upright tree growing to 30 feet, with dark leaves and large plumes of white blossoms. It tends to bloom about 10 days after the late-flowering lilacs and in my zone (4) that is in late June, early July. I planted ‘Ivory Silk’ which is a cultivar from Japan and is commonly available. I discovered this tree because it was planted next to a house I was staying in Connecticut and the heavenly scent filled the whole house. My great-grandmother would have loved this tree. The Bates Hop House is located at 54 Lancaster Street, Cherry Valley. The nursery is open from May to June, 9 a.m. to 5 p.m. Closed Mondays and Tuesdays. During July and August, open by appointment. Call (607) 264-3450.